COSATU held its scheduled Central Executive Committee meeting from 21-23 May 2018. The CEC took time to remember and salute the fallen stalwarts of our movement like Cde Archie Sibeko, Zola Skweyiya and Winnie Madikizela Mandela, whose immense contribution to the struggle for our liberation will never be forgotten. The CEC also remembered workers who died in the mining sector due fatalities caused by non compliance in particular at Sibanye, including the six mine workers who were killed by criminals on their way to work. The CEC also deeply condemned the recent killing of Palestinian protestors by the Israeli Apartheid Regime. We support solid the response by the South African government to this heinous massacre of Palestinians by the evil Israeli regime. We condemn the reckless decision by the US Administration to move the American embassy to Jerusalem. This act of aggression is not just an attack on Palestinians but will derail any hope for peace. The meeting condemned the humanitarian crisis caused by the 12-year-long joint Israeli-Egyptian blockade that has left Palestinians with no access to fuel, clean water and sanitation. We remain deeply disappointed by the support of Israel by some African countries; this is a reminder that there is no unity of purpose on the continent. We congratulate the President of Venezuela Cde Nicholas Maduro and his party for their decisive victory in the recently held elections, despite an imperialist offensive by the Americans against their country. In this meeting, the CEC acknowledged and noted that South Africa is not immune to the USA led imperialist forces that have overthrown progressive governments in Latin America, particularly in Brazil. The US has imposed import taxes on steel and aluminium which have increased the cost of SA steel and aluminium and has the potential to result in loss of jobs in this sector. This US behaviour should also be understood in the context of our new policy on land which Australia, UK and US have indicated that they would do everything to oppose this expropriation of land without compensation. However, the source of this vulnerability is not Donald Trump but our economic policies which are based on free market and non-protection of key sectors against cheap imports. This is clear message that our trade and industrial policies have encouraged the external dependency that leaves this country and its economy vulnerable. The CEC expressed its unhappiness with the heightened offensive against the working class which expresses itself in government policies, which include cuts in real wages, increase in taxes, retrenchments; cuts in pensions and retirement benefits and an increase in unemployment rates. This combined with landlessness, corruption and elicit outflows of billions of rands has left many people of our country trapped in sprawling slums and haunted by the spectre of avoidable diseases and death. The CEC reiterated its frustration with the slow pace of transformation of the ownership and control of the South African economy. This last budget was the best budget that big business could buy. It continued to focus on the monopolised formal economy and said nothing about small firms that are supposed to help the economy grow qualitatively and create jobs for the 9 million unemployed workers. The South African economic policy is still based on the neo-liberal paradigm which remains dominant in driving government's economic policy. These small businesses are struggling with high prices of electricity, transport costs and the non- availability of affordable finance. We have resolved to heighten our struggles on all fronts in the build up to the congress. There is no one other than the working class, who will take forward these struggles and advance and defend our interests and aspirations. The Central Executive Committee's assessment has concluded that our federation and its affiliates have steadily regrouped since the 12th National Congress. Despite some challenges many of our affiliates have gradually regained their focus and strength as we build towards the 13th National Congress in September. Over the last three years, the federation has successfully managed to fend off consistent attacks from a sinister and cynical Alliance of rightwing extremists and leftwing populists, whose goal is to liquidate COSATU. The meeting resolved that the best way to defend COSATU is for our affiliates to continue to focus on an intensive recruitment drive and delivering better service to the members. We denounce the unwarranted attacks on our affiliate SADTU by the rightwing fanatics of the DA and the politically backward IFP during the President's Budget Vote in Parliament yesterday. The attention seeking and organised noisemakers of the DA have made it a habit to attack SADTU every time they want to engage in phony outrage for political propaganda purposes. The DA needs to deal with the rampaging racists in its own ranks and the IFP needs to deal with its own jokey irrelevance. We congratulate SATAWU for waging a successful Bus sector strike and for the strides that the union has made in sorting out some of its internal challenges. The federation will continue to assist all its industrial unions that are still experiencing internal difficulties. COSATU is deeply concerned about the number of workers who lose their lives at work. We have seen a rise in the death of mineworkers, police officers, Emergency Medical Services workers, Farm workers, security officers, teachers, train drivers and other workers in the country. No worker should lose his/her life at work. All employers should be forced to do more to improve the working conditions and the safety of their employees. We shall be campaigning against this deterioration and we call on the department of labour to take seriously these senseless and unnecessary killings and deaths. The CEC condemned the failure by the Human Rights Commission to investigate and intervene on behalf of the most vulnerable workers like domestic workers and farm workers. In the build up towards our 13th National Congress in September 2018, we will also prioritise these following campaigns. The federation has resolved to push for government to pass a law that will ensure that Freedom Day , May Day and Election Day are declared no-trading holidays. This should be done to make sure all workers are allowed to participate meaningfully in these celebrations. We are also calling for government to expedite the work of finalising the work on the Minimum Wage. Workers are running out of patience because the introduction of the minimum wage is long overdue. Raising the minimum wage isn't just good for workers; but it is good for economic growth. The CEC also resolved to vigorously take up the Living Wage campaign now that we are going to have the minimum wage. We plan to work with all other trade unions and workers in general to take this fight forward. The CEC has made it very clear that there will be no privatisation. COSATU wants a report from government Ministers Nhlanhla Nene and Pravin Gordhan to explain where they get the mandate to talk about privatisation in some of their public discussions. We have not seen the benefits of privatising, Iscor, Sasol and Telkom; in fact we saw thousands of workers lose their jobs in those companies. We are drawing a line in the sand on the talk of privatisation because the ANC does not have talk of privatisation but has resolutions on nationalisation. COSATU is extremely unhappy by the lack of political will to investigate and prosecute private sector corruption. We have raised this matter sharply with President Cyril Ramaphosa in our meeting on Tuesday. We want decisive action against Steinhoff Senior executives, KPMG Managers and Tiger Brands management who are implicated in corruption. It is totally unacceptable that despite the fact that there were amendments made to the Competition Act criminalising collusion and calling for jail terms of up to ten years for directors and employees found guilty, there is no one who has been sent to prison. The private sector is also fully responsible for the mess that the country finds itself in and we want government to show the same commitment and enthusiasm in fighting private sector corruption that they have shown for public sector corruption. COSATU continues to argue that energy production is the hallmark of industrial capitalism. Hence we argue that energy production; transmission and distribution cannot be left to the private hands but must be state-owned and controlled. This is a national security sector which must be protected from private sector profit motives. We therefore demand that the corporatisation of Eskom and current attempts to privatise its assets must be stopped. We are still very angry that government signed an agreement on the renewable energy independent power producers (REIPPs). This was done despite COSATU's section 77 notice on IPPs on the closure of Eskom power stations at Nedlac. Our submissions clearly highlighted the plight of the workers, who will be negatively affected by the eminent closure of the power stations and the mass roll out of the REIPP program. We demand that government should have the IPP contracts suspended immediately. COSATU noted the progress that has been made in the Public Service Wage Negotiations. We are aware that COSATU unions are still consulting their members. We hope that they will finalise this process within the allocated twenty one day timeframe and the negotiations can be speedily resolved. COSATU reiterates its call for all social partners to expedite the convening of a Jobs Summit that will seek solutions to the scourge of unemployment and ongoing job losses taking place in the country. The last job figures by Statistics South Africa are very depressing and show that despite our economy growing marginally, the rate of unemployment remains stubbornly high. The latest revelations by AngloGold Ashanti that it plans to retrench 2 000 mineworkers in all its operations in South Africa and by Evander Gold Mine in Mpumalanga that it plans retrench 1722 mineworkers at the end of this month is proof that the situation is more urgent. Lonmin wants to retrench 12 000 over three years, starting with 3000 workers this year. We need an urgent moratorium on retrenchments or the Job Summit itself will become redundant and useless. We expect the summit to address the ongoing investment strike by big business and also the inappropriate macro-economic policies that have resulted in economic stagnation and the ongoing job losses. We want this summit to also grapple with the role played by technological 'solutions' that are imposed with no regard for local economies and the misery that they bring to those who are pushed aside by such developments. The COSATU CEC is making a call that the issue of land expropriation should benefit the poor communities starting with farm workers. Farm labour tenants are the most vulnerable because they are unable to access government services like houses, electricity sanitation, etc. We also want the ANC to adopt a resolution that no politician should be a beneficiary of land expropriation without compensation because that constitutes a conflict of interests. Politicians should not be allowed to be the biggest beneficiaries from the government policies they have adopted. Workers and the poor are tired of politicians who are in it for themselves and who are driven by the "I did not struggle to be poor" mentality. We also want land to be given to emerging farmers and all those who are backroom tenants, who need land to build houses for themselves. We are deeply alarmed by the Auditor General's report on Municipalities that shows that there is a 75% increase in irregular expenditure. This is totally unacceptable when you consider the fact that we as the workers are picking up the tab through increased taxes. We demand that all senior managers from the implicated municipalities be replaced and investigated. When there are service delivery protests, most of these municipalities blame a third force instead of taking responsibility. This failure to respect and follow proper policies should be followed by consequences for the people in charge. We also support SAMWU in their fight with SALGA for better wages and improved conditions for the workers. After this report from the Auditor General about irregular expenditure, workers need to fight for what is due to them. The CEC received a comprehensive political input from the President of the ANC and the country Cde Cyril Ramaphosa. We thank the President of the ANC for availing himself to come and address our meeting and engage with the CEC delegates. The meeting acknowledged the positive steps by the new administration to fight corruption, clean up the SOE's and other state institutions. We also welcome the president's continued commitment to the Alliance and we look forward to the convening of the Alliance Political Council meeting that will deal with the state of the ANC, the Alliance and government. We want an Alliance that will collectively develop policy in line with the vision of the Freedom charter. The Alliance should collectively monitor the implementation of policy, collectively decides on deployment, and can call ministers and the president to account. We are prepared to fight to have an Alliance that is prepared to fulfil its historical mission. The Alliance Political Alliance meeting needs to deal with the reality that after a quarter of a century with the ANC in power, the socio-economic conditions of the people in terms of unemployment, inequalities and poverty have worsened rather than improved despite some achievements made by government. ANC's failure to honour its position on the VAT. The ANC has repeatedly promised not to increase VAT and COSATU is not going to let this matter of the VAT go until it is reversed or alternatively there is an expansion of zero-rated goods. The government's anti-worker budget has handed the tab of corruption, maladministration and policy failures to the working class through VAT increase; while refusing to increase the Company Income Tax. Big Companies were given Tax breaks in 2013, with the Corporate Tax reduced from 34% to 28% and they rewarded government by retrenching 485 000 and then boasting in 2016 that they had R600 billion that they were not going to invest. We are uncomfortable with the continued recycling of ministers and board members of the SOE's. We want the president to honour his promise of cutting down his bloated cabinet and stop deploying the very same ministers, who have implemented the failed policies of the last 24 years. We want the ANC to fight the "bling" culture of wasteful expenditure that has seen ministers spending millions on themselves and their families, while 13 million South Africans live below poverty line. The vulgar spending by cabinet ministers is an insult to the millions who go to bed hungry everyday in this country. We need to resolve the old habit of unilateral decision making on policy matters that is the source of tensions in the Alliance. The introduction of IPP's is a case in point. Minister Jeff Radebe has proved to be the most anti-worker minister of the last 24 years and his decision to sign IPP's two days after his appointment was a slap in the face to the many workers and families, whose livelihoods he puts at risk. We have to discuss the staunch refusal by the ANC to shift the macroeconomic framework from its Neoliberal trajectory, despite rhetorical statements about the centrality of job creation and economic transformation. We also need to address the ongoing retrenchments and the deterioration in health and safety in many sectors of the economy. Some ANC ministers and NEC members were amongst those who lobbied and fought for the loose regulation of the Mining sector under Minister Susan Shabangu. 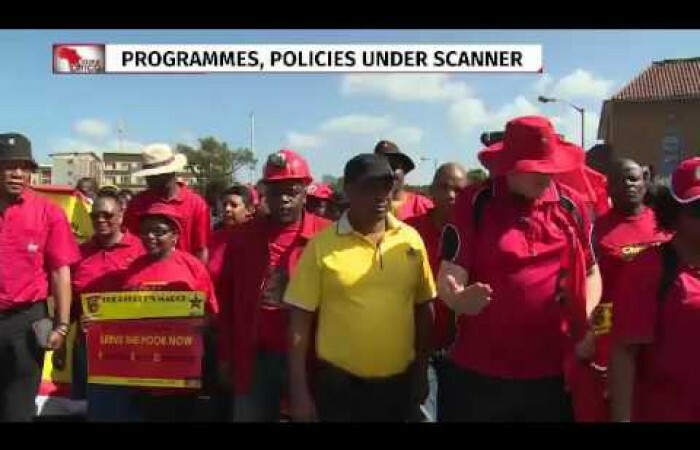 COSATU wants government to oppose the takeover of Lonmin by Sibanye Stillwater until they improve their safety record. We also want to hear why government is not implementing the resolution of a State Mining Company. The deteriorating public transport system that is costing workers their jobs and their lives. The attempt by the Minister of DPSA to play the workers against the public during this side of wage negotiations. The so called planned public hearing by the minister on the wage bill is an intransigence of the worst order. The ANC government needs to implement the resolution on the State Bank and on the mandate and ownership of the Reserve Bank. A shift in the macroeconomic policy framework in line with the ANC resolutions. Firmness and decisiveness in dealing with ill-discipline and corruption in government. Repositioning of the ANC and government in order to provide political and moral leadership to society. COSATU is also calling on all Alliance structures to work together and stop the political killings that are continuing to take place in KZN. We condemn this deterioration and anarchy and we urge the law enforcement agencies to stop these political assassinations by arresting the perpetrators. Lastly, we welcome the resignation of Premier Supra Mahumapelo and we hope that the ANC will hold all those responsible for corruption in the province accountable.